Inside this black bonded leather 3-ring binder you'll find a convenient pen loop and various pockets, ideal for your ID, business cards, and correspondence. 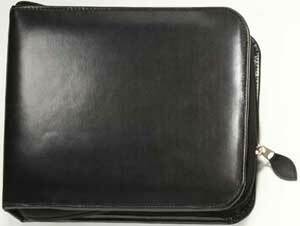 The binder opens flat for ease when writing checks and zips closed. Regular price $37.95. The dimensions are 10-3/4" x 9-1/4" x 1-1/2".